On exchange from the University of Weseda in Japan, third year Business Administration student Kenji Koyama’s decision to study in Australia was two-fold. Gaining broad business administration skills and education was his first reason, and the chance to improve his English came in a close second. Kenji has lived in numerous countries including Guatemala, Brazil and Japan but had never actually met an Australian before arriving in Melbourne. His cultural curiosity and desire to improve his English was what brought him to Monash University, and to Peninsula campus. 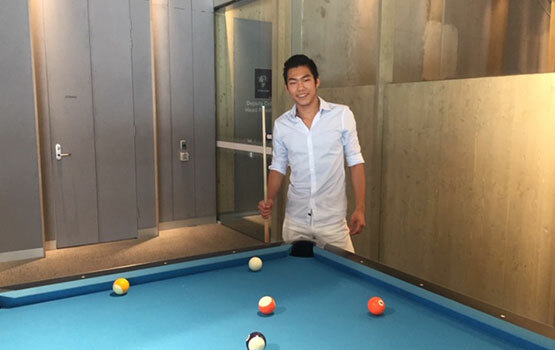 Kenji lives in the student village on the Peninsula campus with eight other housemates and regularly uses the communal areas of Gillies Hall to play pool and practise his piano skills. Arriving only a short time before his course began, Kenji threw himself into the orientation week activities, enjoying the City Scavenger Hunt and Amazing Race. The Amazing race also took Kenji to the beach for the first time since arriving in Australia. Kenji highly recommends living on campus to any student thinking about it as it’s a great way to meet people and gain confidence before classes start. Safety and security is also another factor with security guards patrol the campus every night. Looking towards the future, Kenji plans to return to Japan when his studies are finished and start up his own company. He says the skills and practical experience he is gaining in Business Administration degree will be invaluable.